Wash hands. Preheat oven to 350˚F. Beat butter with a mixer until creamy. Add granulated sugar and brown sugar, beating until light and fluffy. Next add eggs beating at low speed until blended. In a separate small bowl, mix flour and other dry ingredients. Alternately, add the dry mixture and the sour cream to butter mixture, beginning and ending with dry mixture. Beat at low speed just until blended after each addition. Stir in walnuts, apples, and vanilla. To make the streusel, mix together brown sugar, flour, and cinnamon in a small bowl. Stir in walnuts and melted butter until crumbly. Spoon batter into well-greased muffin pan. 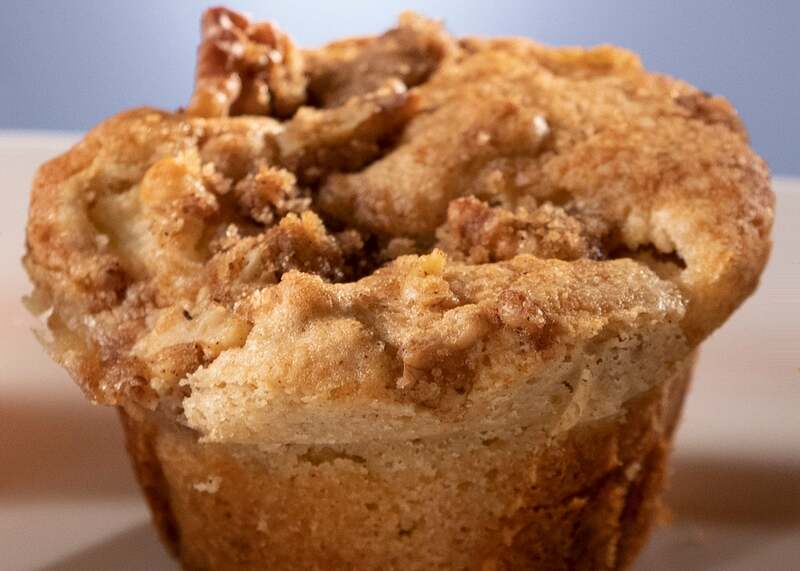 Sprinkle about one tablespoon of the walnut streusel over each muffin.